Its stated purpose is to define an internationally agreed set of standards that can be used for any type of software testing. However, it has never been a proven standard; still it has helped many testing teams over the years. Here we will go through the test process ISO/IEC/IEEE 29119-2:2013. The purpose from ISO/IEC/IEEE have been to create a series of useful standards within software testing, which goes deeper than the fundamental test process and which support test processes on organizational level, test management level and dynamic test level. It do not matter if you organization or project is large or small; this standard can be applied on all levels as it is a generic test process and it is applicable for all software development lifecycles models, both traditional waterfall models and agile. Who will benefit from this standard? All people who are involved in software development will benefit from this process: Test Managers, Testers, Projects leaders, Scrum Masters, Product Owners and Developers. The days are gone, where it is only Test Managers and testers who are interested in good test processes. In software development and testing, we use a lot of terms and definitions. At the end of this process walkthrough, you will find a table containing used terms and definitions. This contains the process for the creation and maintenance of organizational test specifications, such as organizational test policies, strategies, processes, procedures and other assets. This contains the processes that cover the management of testing for a whole test project or any test phase (e.g. system testing) or test type (e.g. performance testing) within a test project (e.g. project test management, system test management, performance test management). 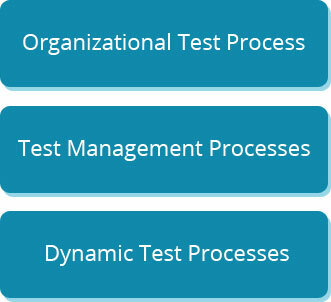 This contains the generic processes for performing dynamic testing. Dynamic testing may be performed at a particular phase of testing (e.g. unit, integration, system, and acceptance) or for a particular type of testing (e.g. performance testing, security testing, and functional testing) within a test project.